Maurice Templeton organized and operated the first Christian cruise some 35 years ago. 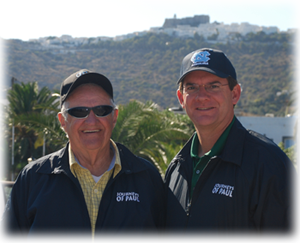 He originally entered the travel business in 1967 when, as a lay Christian leader, he organized a tour to the Holy Land. Immediately his love for Christian travel began. After working with several tour operators, he realized the need for a quality agency to cater to the desires of the Christian traveler and in 1980, TEMPLETON TOURS, INC. was formed. Maurice has been arranging quality tours since that time, focusing his attention on the needs of the Christian traveler. Although retired in 2003, Maurice still travels on the Christian charter cruises and an occasional Holy Land tour. Over the years TEMPLETON TOURS has grown to offer multiple Christian cruise charters, and Holy Land tours annually. TEMPLETON TOURS arranges travel for many of today's top Christian leaders. You probably know someone who has traveled on one of our tours. Ask them about the quality, service, and dependability of TEMPLETON TOURS. Whether it be an Alaskan cruise or a Holy Land tour, we are familiar with the sites and local tour operators. With over 100 successful full ship charter cruises and over 500 Holy Land tours to our credit, you can count on Templeton Tours to deliver. Thirty years of operating Christian cruises and tours can only be accomplished when your word is your bond.ServiceFrom small groups to large, you will always get the same great service from our professional staff. Whether you are traveling to the Holy Land, Greece, Eqypt, Hawaii, Alaska, or on a Caribbean cruise, TEMPLETON TOURS understands the demands of the discriminating Christian traveler. Come travel with us so we can show you why we say, "Templeton Tours is The Leader in Christian travel ". Templeton Tours Inc. is a Christian Tour Company specializing in Christian cruises and Holy Land tours.